November 9, 2018 (Rockford, IL) – At an award reception put on by the Rockford Register Star, Blackhawk Bank was honored with three 2018 What Rocks Awards. What Rocks honors the best of the best in the Rock River Valley. The voting for nominees began this past July and the top five nominees made it into the final round of voting. In September, the final voting round commenced and three finalists were identified in each category. 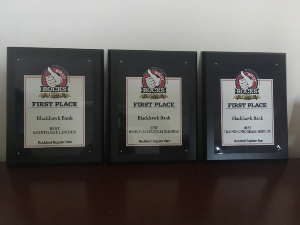 Blackhawk Bank was proud to be a finalist in several categories and elated to find out they would be taking home the following three What Rocks Awards. “Without the dedication and support of our Blackhawk Bank Family, clients and the community, we would not be where we are today. We owe our success to them and we will always remember that,” stated Rick Bastian, Chairman Blackhawk Bank. Established in 1881, Blackhawk Bank has served individuals, families and business owners for 137 years. The Bank operates eight full service banking centers in Beloit and Janesville, Wisconsin and in Rockford, Belvidere, Machesney Park and Roscoe, Illinois. The Bank also operates a Business Banking Center in Elgin, Illinois and a Mortgage Processing Center in Roscoe, Illinois. Complete information about Blackhawk Bank can be found at www.blackhawkbank.com.